Galanthus are commonly called ‘snowdrops’ and are a late winter flowering bulb valued for the colour at this time of the year. They are one of the first bulbs to flower after winter and with many species and cultivars available you will be surprised with the range available. Galanthus bloom in early spring and prefer a humus rich moist soil in part shade. Add a top dressing of compost each year when they are dormant. 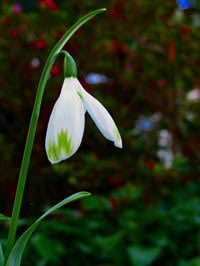 Most Galanthus do well in part shade beneath deciduous trees and can also be grown in pots or containers. Galanthus will grow to 15cm depending on species. Propagation of Galanthus or ‘snowdrops’ is from seed, or more usually by dividing established clumps during dormancy. Over time they will naturally form large clumps and can be left for many years before dividing. Galanthus nivalis is perhaps the most common of the species while Galanthus Ikariae is an interesting species with green inner petals, from the Aegean islands. Always make sure that newly purchased bulbs are firm, soft bulbs will generally mean poor storage and will probably not grow.